Captivity is no place for a wild animal. “If you don’t want to be beaten, imprisoned, mutilated, killed or tortured, then you shouldn’t condone such behaviour towards anyone, be they human or not.” – Moby. Although seals tend to fair better than cetaceans (dolphins, orca and whales) in captivity, the practice should not be considered any less distasteful. While we applaud marine parks for their rescue, rehabilitation and subsequent release of sick or injured animals, we condemn in the strongest of terms the keeping of marine mammals for the purpose of exhibit, display and so called “entertainment.” This is a sentiment that is echoed by numerous anti-cruelty organizations, including the NSPCA and the Humane Society. Marine parks and aquariums will have you believe their animals form part of the exhibit to create awareness, are the objects of scientific studies and fulfill an educational role. The reality of the situation is that captive wild animals are nothing but a poorly disguised money making scheme in which facts are badly misrepresented. The shows in which these animals are forced to take part in are devoid of educational value. They depict animals in an un-natural setting, forced to live on an un-natural diet and perform un-natural behaviour. Neither are captive pinnipeds accepted as subjects of the study of their species by the scientific community. Educational or a money making farce? The conditions in which these animals are housed are questionable at best. They are cramped and lack not only sufficient space for the animals to move about and exercise in, but are also devoid of natural stimuli found in the wild which would otherwise keep the animals occupied. Attempts to introduce “toys” for the animals to play with are often rejected with numerous reports detailing the animals initial fear or aggression to these introduced objects. Cages do not provide adequate space. The most common pinnipeds found in captivity are fur seals, sea lions and walruses. They require free access to fresh water in order to regulate their body temperatures, something that is denied to many pinnipeds who are kept in waterless pens. These animals are gregarious in nature yet are often caged in solitary confinement. Their social interactions in the wild are strictly governed by a hierarchical order comprising of dominant bulls, breeding females, sub-adults and juveniles. Such dynamics are severely disrupted by captivity in which rewards are given to animals which “behave” or perform better. Cramped and confined conditions lead to frustration and result in bitter fights with animals often being severely injured as they are unable to flee from the aggressor. Lack of physical exercise and mental stimulation, coupled with a breakdown in normal social behaviour, leads to situations where the animals are listless, unresponsive and will often chew on the wiring of their cages, thereby chipping teeth and lacerating gums. Unlike dolphins who tend to be the more popular attractions at marine parks, the welfare of pinnipeds is often overlooked, particularly by a gullible public who are denied access to behind the scenes. Whistle-blowers are regularly quoted in the media as describing a pattern of neglect that has repeatedly resulted in animals suffering. Poor water quality has been cited in various articles as being the leading cause of marine mammals becoming sick. Fur loss, skin damage and even blindness have all been attributed to poor water quality. In researching this section of our website, we were shocked and dismayed to discover the high number of animals in captivity that have become blind while undergoing rehabilitation or are suffering from impaired vision and serious eye problems. Almost every facility we researched has at least one or more animals suffering from ocular disease. From uShaka in South Africa to Marineland in Ontario. So severe is the problem that captive pinnipeds are regularly required to have eye-drops as a preventative measure. Aside from poor water quality, UV light reflected from the blue paint in the pools as well as from a lack of shade has also been blamed for damaging eyesight. Rather than accept responsibility for their role, marine parks shrug these problems off and attribute corneal ulcers and more to old age, a ridiculous situation considering several animals have not even reached sexual maturity. 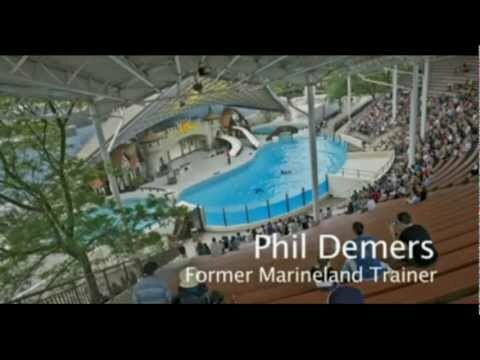 In the video below, a former trainer details just some of the horrors that take place in marine parks around the world on a daily basis. Aside from eye problems, captive pinnipeds face several other anomalies not experienced by their wild counterparts. While seals are opportunistic feeders, they prefer to eat live fish. This is not always possible in marine parks and fish gets frozen in large quantities. The problem with this is vitamin E and mineral content is destroyed through the freezing process while thawing promotes bacterial growth and spoilage. This results in several known problems not limited to dermatological problems, anorexia, salt deficiencies, tremors, lethargy, weakness and convulsions. Bacteria produced in thawed fish has resulted in diarrhea, abdominal pain, vomiting, inflamed mouths and throats, gastroenteritis, salmonella poisoning and even death. Prolonged exposure to these conditions results in stress. This causes the brain to produce more cortisol. which in turn suppresses the immune system and decrease bone formation. Cortisol is also responsible for umpteen ailments including anorexia and the shutting down of the reproductive system. This may lead to infertility and an increase in miscarriages and birth defects. If one were to consider contagious diseases, the close proximity in which the animals are confined vastly increases the chances of cross infection. Tuberculosis for example, has been known to wipe out entire contingents of marine mammals in zoos and parks around the world. Even more worrying are the zoonotic implications when such diseases switch hosts and infect humans. To increase profits, marine parks resort to cutting back on staff and essential training. Staff shortages and incompetent staff means that the severity of illnesses and injuries are often overlooked and only get reported to the veterinary teams once the situation has become critical, even though early diagnosis and treatment would have saved the day. When considering all of the above, and taking into account the mountains of documented evidence on mistreatment, abuse, maladministration, high staff turnover rates, poor upkeep, unsanitary conditions, illnesses and injuries sustained to both animals, trainers and even the general public; it soon becomes very clear that captivity is no place for a wild animal and is certainly no place for one so noble, beautiful, graceful, gentle and intelligent as a seal. We therefore ask that you do NOT support this brutal cruelty by spending ANY money at zoos, circuses and marine parks guilty of exhibiting wild animals.